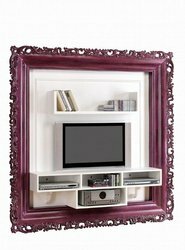 This luxury Modern TV Stand Wall Decor sports a distinctly modern transitional look for your home decor. This stunning TV Stand is versatile enough to be placed anywhere in your home or office as a sophisticated show piece. This Wall Decor is made from solid Birch wood and looks exquisite with its intricate hand carved details. Modern trend and elegant style join to create a unique piece able to create infinite design solutions with existing furniture pieces or create a bold reference point in any home or commercial space. Note: TV, Accessories, and Decor are NOT included with TV Stand Wall Decor.